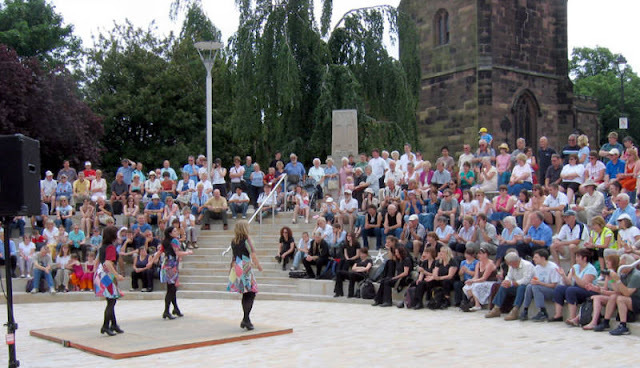 The start of a new era for Middlewich's town centre over the weekend of June 17th -19th 2005 as the amphitheatre fills with townspeople and visitors for the Folk & Boat Festival, the first festival to use the facility after its completion in April of that year. 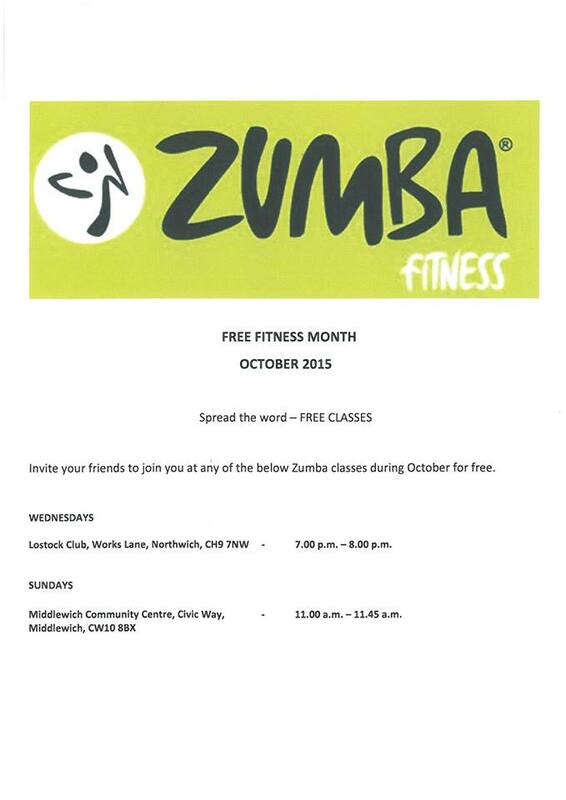 Our thanks to the Town Council's Events Manager, Dave Thompson, for supplying the photograph and information. 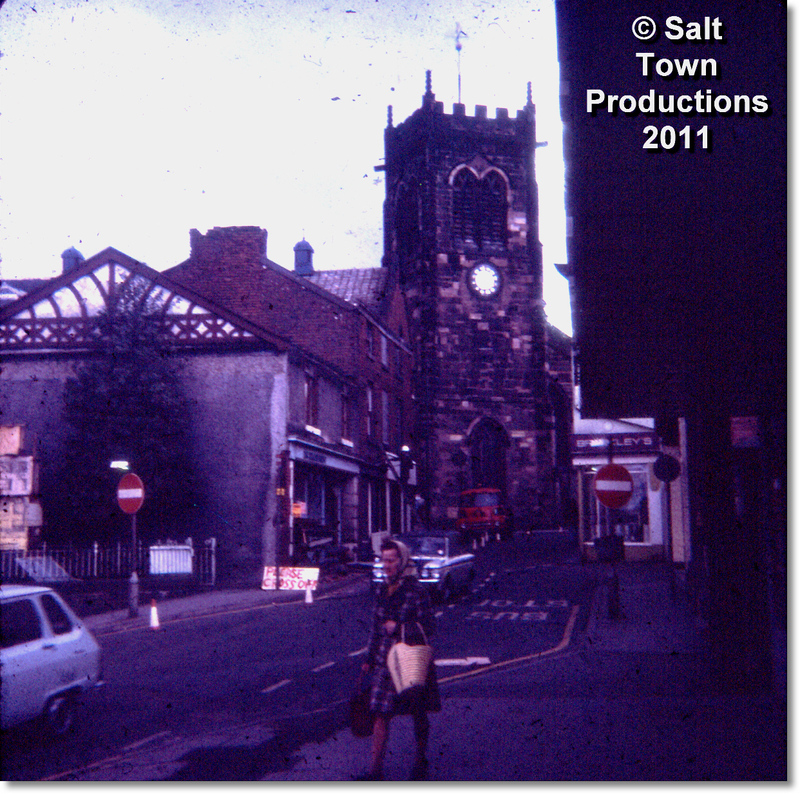 This is Hightown in 1970, looking, on the face of it, not very different from the way it looks today. 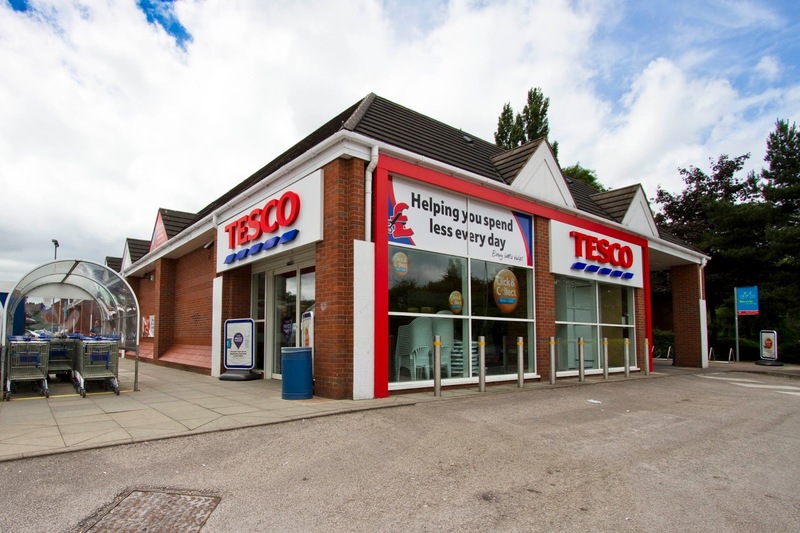 On the extreme right is what would, at that time, have been Hulme's Grocers, although there is little here to indicate that it is a thriving concern of any kind. 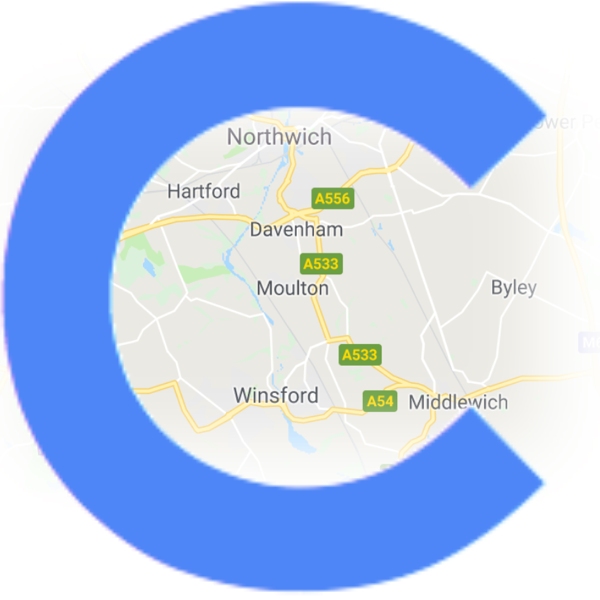 The shop is now home to the Accord Clinic, whose owners can always be relied on to provide interesting themed window displays when ever there is a festival or special event going on in the town. Next left is the Kings Arms, complete with the original black and white version of its very ornate sign, which was later repainted in Greenall Whitley corporate colours. The sign itself has now been replaced by a simpler design, although the elaborately scrolled bracket remains.. The pub itself was a simple 'boozer' until the 1990s when it was refurbished and extended, as noted here. On the other side of Queen Street is no 28 Hightown, later to be the home of Harold Woodbine's radio, tv and electrical shop and now the Parish Church's 'Drop In Centre'. In the centre of the (main) photo it can just be seen that the C of E Infants School and the Wesleyan Methodist Chapel are still standing in Lewin Street. 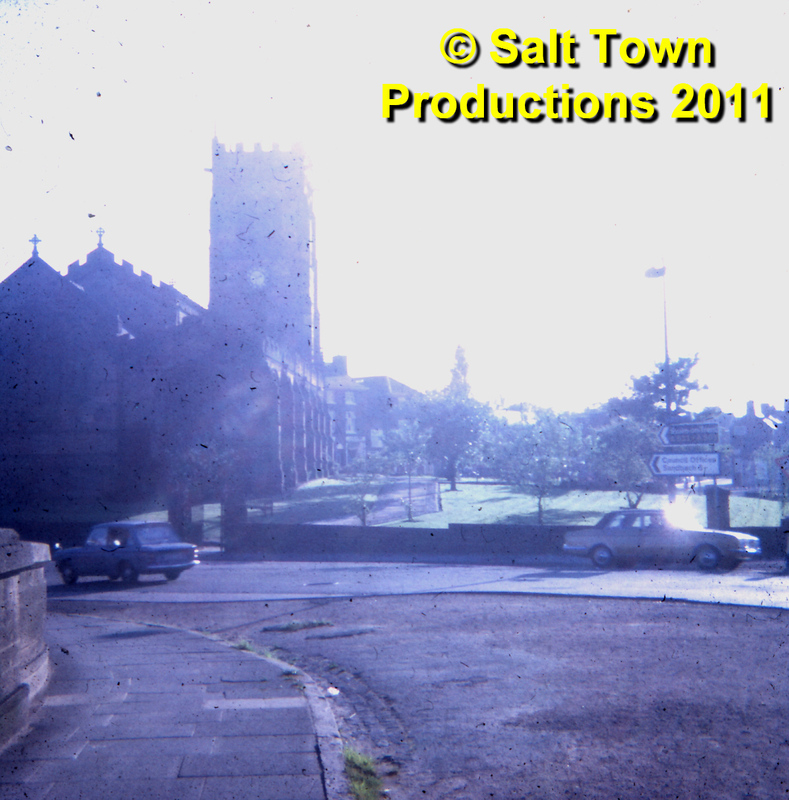 Hightown itself - that is to say the actual carriageway - has changed considerably since 1970. The roadway has been altered over the years to accommodate changes in traffic flow. In fact, surprisingly enough, in 1970 certain sections of the road were actually wider than they are today, and the pavements narrower. A rare 'win' for pedestrians. Yes- check-out the the Kings Arms` new, plastic windows they`ve fitted!! The windows in question can be seen here - ed. 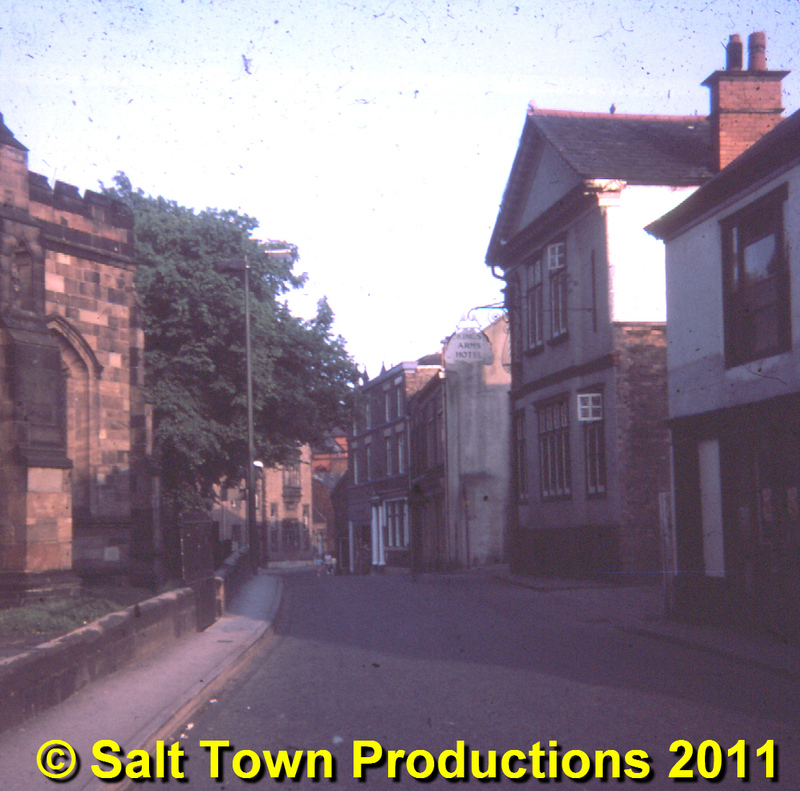 A 35mm slide, companion to this one, showing the other end of this now-vanished row in Nantwich Road. 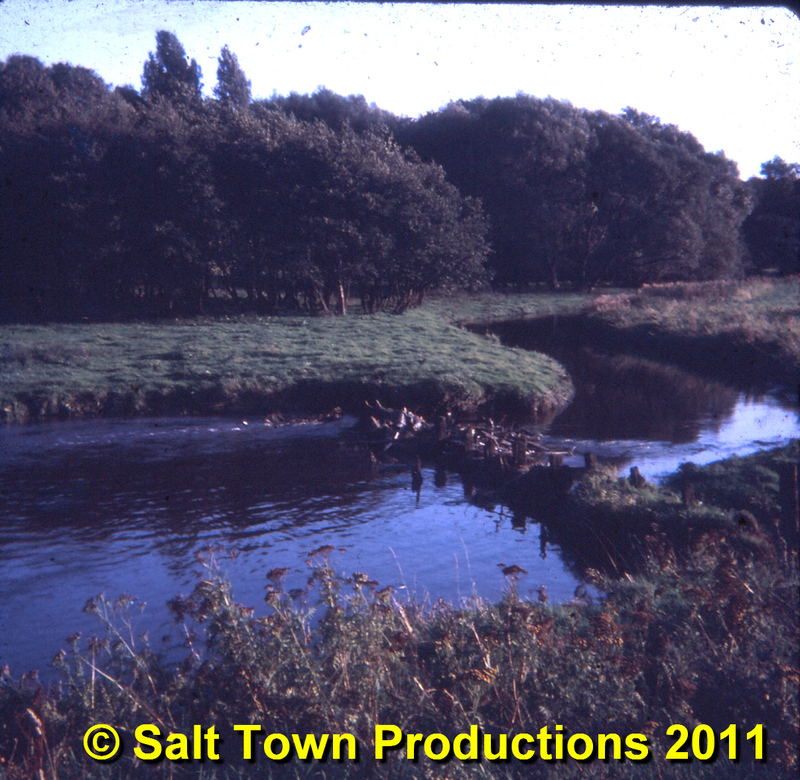 Jack Stanier, who took the colour slide, describes it as 'late 60s', though it may, possibly, be from slightly later, and was probably taken at the same time as the 'Lea's Passage' slide. The entrance to Lea's Passage, as seen in that earlier photo, is at the far end of the row. and in the right foreground we can see the junction of Nantwich Road and Newton Heath, along with Risley's corner shop, representative of many such shops dotted all around the town, which served Nantwich Road, Newton Heath and Newton Bank - in fact, the whole of what used to be called 'Newtonia'. I was born at number 15 in that row. There were 8 of us all living in a two up two down and the loo was outside .We were the Wilkinson family . We lived at No. 25 Nantwich Road and I recall Risley`s corner shop was full of sweets/pop and other numerous household essentials! 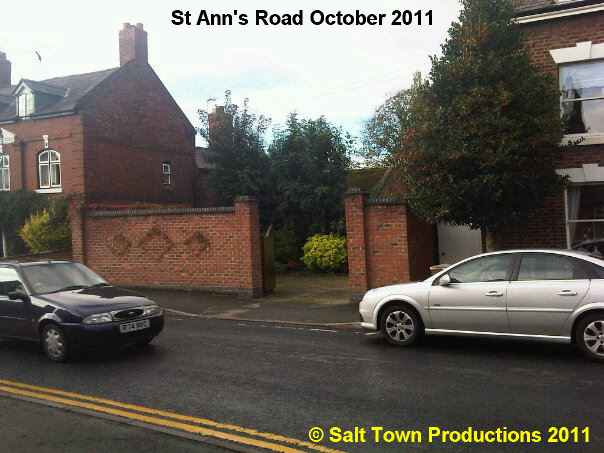 I also remember the huge cinema bill-boards (on Newton Bank) directly opposite these houses. 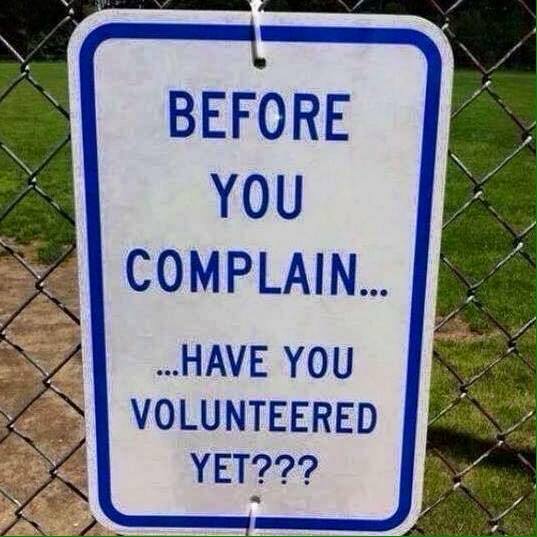 I`ll ask my dad to advise which one was no. 25. I`m sure it had a window on the left side of the door but it definitely wasn`t next door to the shop. That much I do know!! Our exclusive picture shows future Town and Borough Councillor Mike Parsons sharing a joke with Tony Hatton, then proprietor of the Big Lock pub, sometime in the early 1990s. 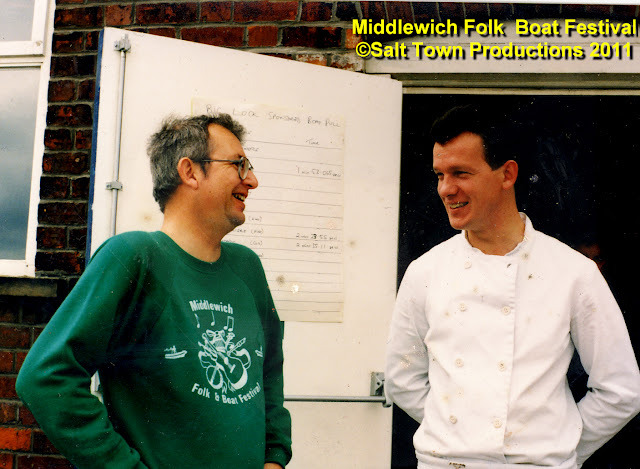 Although Mike was one of the organisers of the Folk & Boat Festival, and Tony one of its keenest supporters at this time, the photograph was actually taken on a different occasion, at the Annual Boat Pull organised by the Trent & Mersey Canal Society. Mr Parsons is sporting an example of the second version of the MFAB sweatshirt. 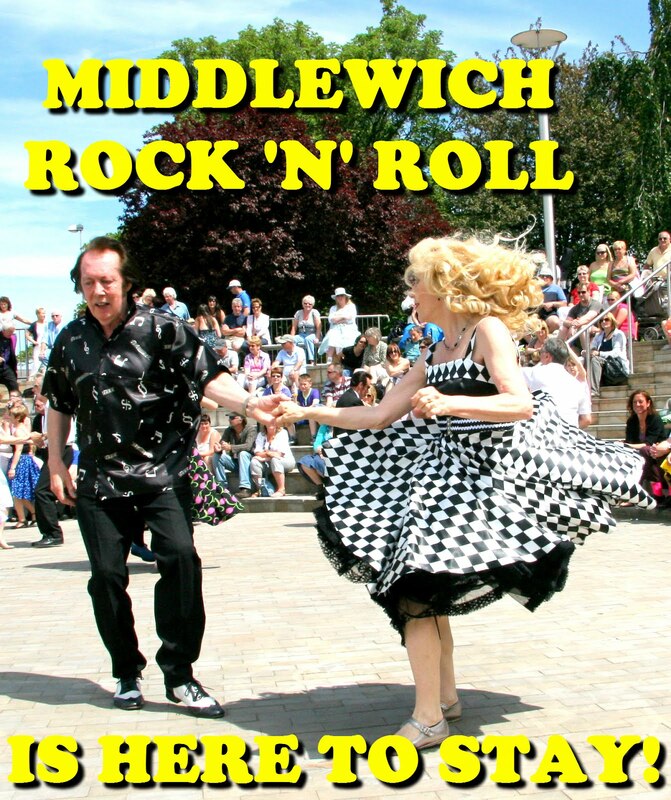 The original design, produced for the first festival in June 1990, was similar, but had the wording Middlewich 1st Folk & Boat Festival with the festival dates underneath. 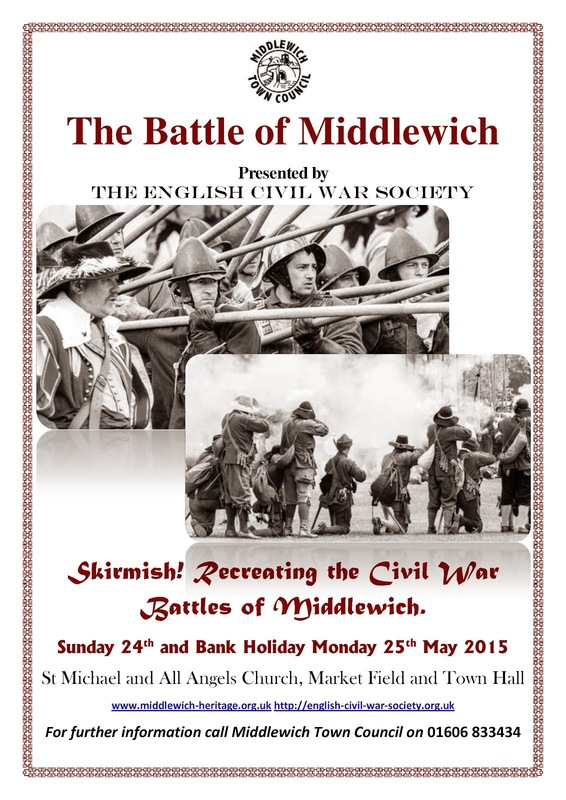 The 'Middlewich' and '1st' should, arguably, have been the other way around. 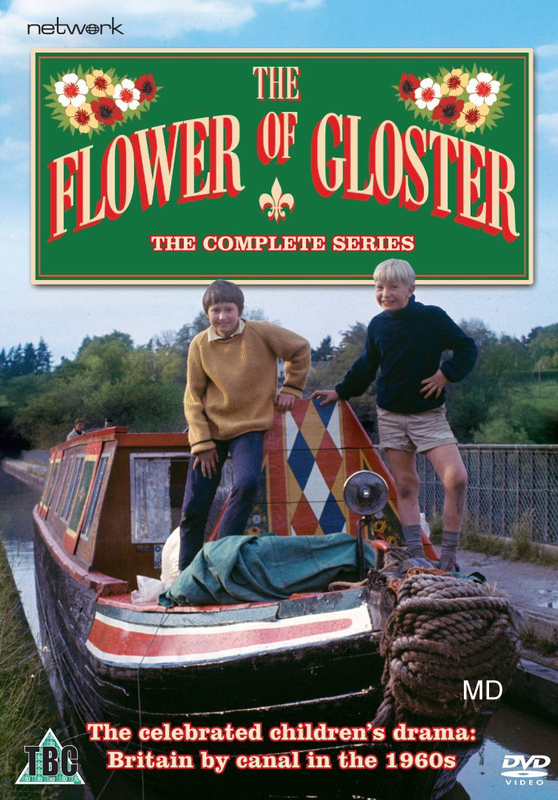 Original examples are now much sought after collectors' items. Our slightly tongue-in-cheek title is an oblique reference to the Cheshire Life which always labelled photographs of our betters, clutching glasses of champagne and laughing uproariously, with such captions as Lord Weaverham shares a joke with Lady Cholmondeley-Twissington-Smythe during the Wilmslow and District Asparagus Growers Annual Dinner Dance at The Grosvenor Hotel in Chester. We do not move in such circles, so this is the best we can offer. Stephen Dent Strange really - I recognised Tony straight away but Mike looks very different. Well, actually, 'commissioned' is probably rather a grandiose name for what went on. I cornered him in the back room of the Kings Arms Hotel and plied him with pints of Greenall Whitley bitter until he agreed to write some stuff for me. 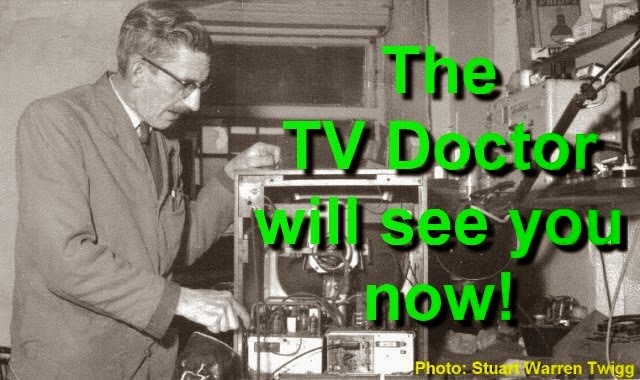 The results usually arrived, several weeks after the deadline, in the form of notes, many of them indecipherable, written on scraps of paper and old envelopes and the like which I, after many late night telephone calls to John seeking clarification (not to mention 'urgent' meetings in the pub to discuss obscure points), would turn into articles. 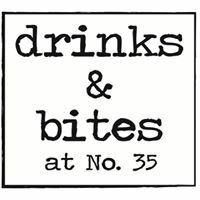 This is one such article - just a brief fragment, really - and was,actually, a tailpiece to a longer article about the Kings Arms which will be featured here in due course. 'Old Nell', short as it is, does, I think, illustrate John's instinctive flair for storytelling, first experienced by myself and other enthralled youngsters in the late 50s at Wimboldsley School where John would regale us with ancient stories from his native Wales. Picture the scene. The tap room is crowded. It is market day and the town is full. 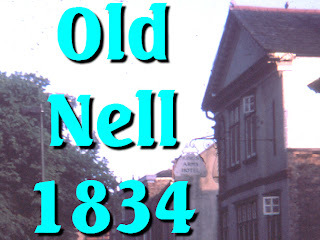 In comes a man, followed by Old Nell. Space is quickly cleared at a table for them both to sit down. The barmaid walks over and asks them if they would like their usual order. The man nods his head and the drinks are delivered. 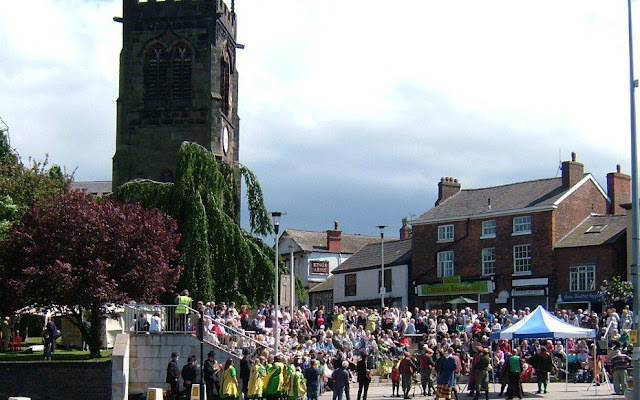 They are both well known in the town and questions are asked with regard to the odds on the afternoon's contest. The man smiles and says they are 'good'. Just then the clock chimes and it is time to go. A passage is quickly cleared for them and the pair depart, followed by most of the others. They go down to the Market Square and make their way to the Bullring. There is a stout post embedded in the centre to which two chains and shackles are attached. The two of them walk to it, and Old Nell prepares for her last performance. Nell was the last bear to be baited in Middlewich. She was well-known in the town, and she loved her glass of beer. Sharon Barnard What a great story! 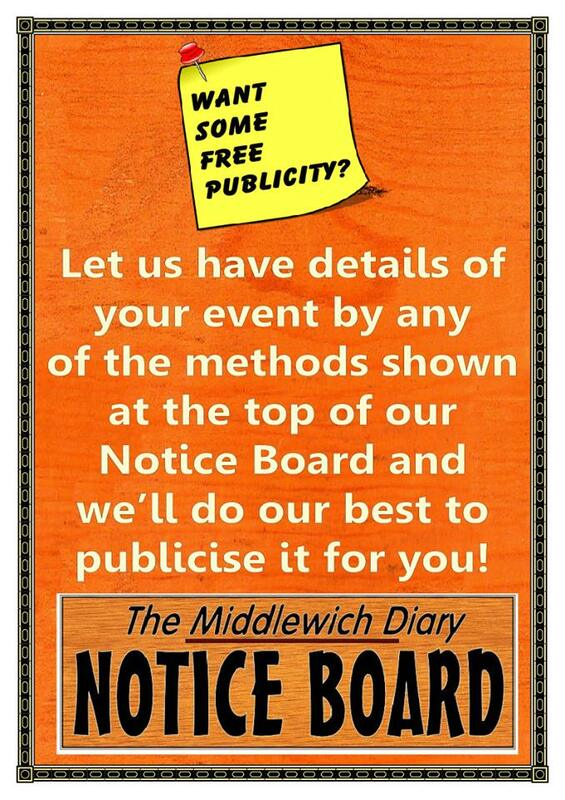 This slide was originally posted on the Middlewich Town Council Facebook Group on the 19th August 2010 as a kind of 'trial run' for the 'Middlewich Diary' and we've had to borrow it back from there, as the original slide seems to have gone missing. We originally dated this one as '1971/2' but we now know this is wrong, because at that time the buildings on the wharf hadn't been whitewashed. So we've revised the date to 'circa 1973'. The buildings in our picture look a lot smarter than they do in the present day, and there are more of them. Particularly sad was the loss of the small building with the chimney, centre right, which was originally, I think, a small laundry (or 'wash-house'). It's last known use was as a handy surface for one of the explanatory boards for the Roman Middlewich Trail. 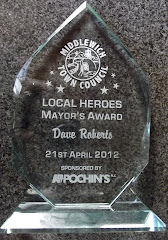 This has now been relocated to the wall of the Leadsmithy Street bus-shelter a short distance away. Note that, alongside the main warehouse building, attempts at smartening up the area by tree-planting have been made. And looming over the warehouse are two of the large buildings in Lewin Street which disappeared a couple of years later to make way (eventually) for the Salinae clinic. To the left is the Wesleyan Methodist Chapel and, to the right, the C of E Infants School. 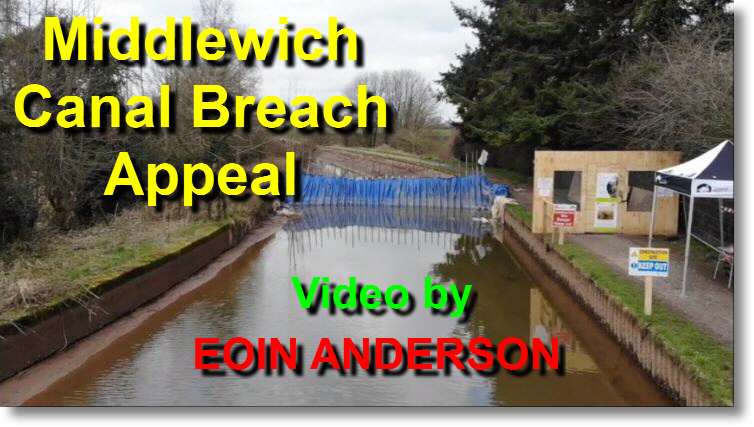 We won't make any further comment on the 'Gateway To Middlewich' scheme proposed for this area, except to say that we sincerely hope that it happens sooner rather than later. Another idyllic Middlewich scene from the Summer of 1967. The River Wheelock meanders through meadowland in the river valley below Nantwich Road before running over the weir underneath Mill Lane. Behind the trees in the background is the aqueduct which takes Nantwich Road under the Shropshire Union Middlewich Branch canal. A second aqueduct, a few yards to the right, takes the river under that same embankment, and is said to be the twin of the familiar road aqueduct. 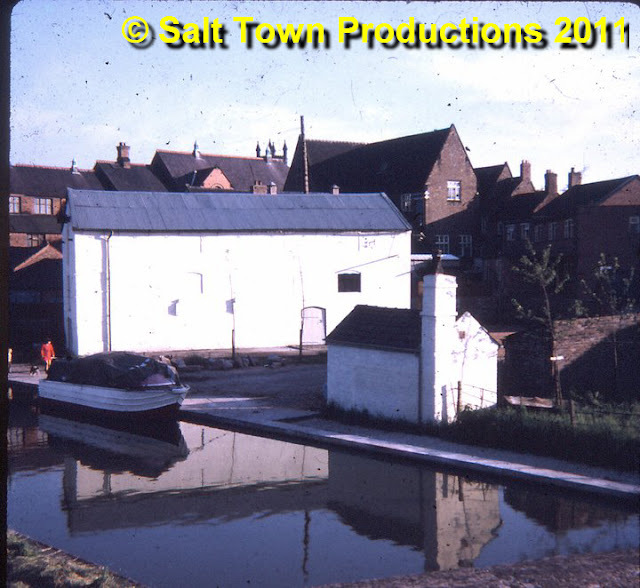 On the extreme right of the photograph part of the.embankment can just be seen, taking the canal off in the direction of Church Minshull. 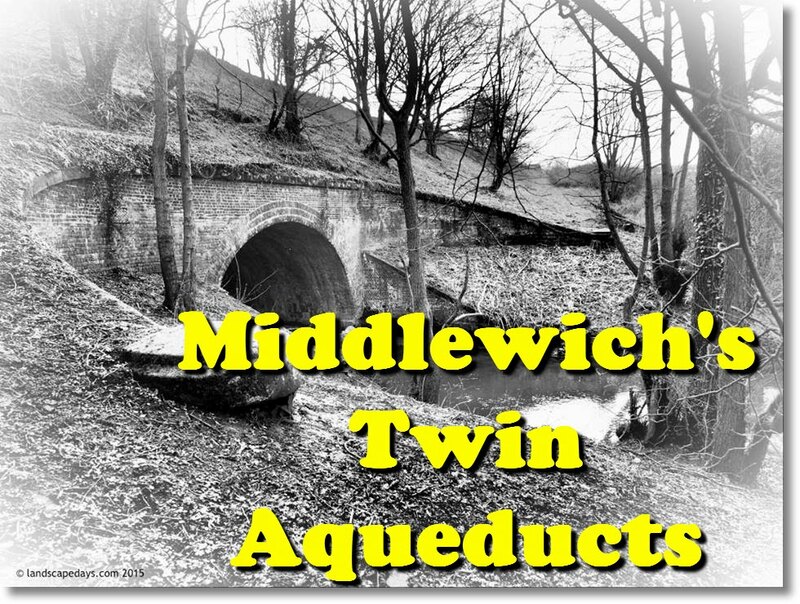 The Middlewich Branch was built late in the canal era. In fact by the time its construction was authorised the railway age had begun and the branch was built very much like a railway, with cuttings and embankments, rather than simply following the contours of the land as the earlier Trent & Mersey did. In 1967 everything looked trim and neat and the area was almost like parkland. 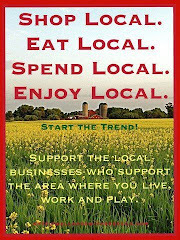 This is not the case now, as explorations this Summer proved. 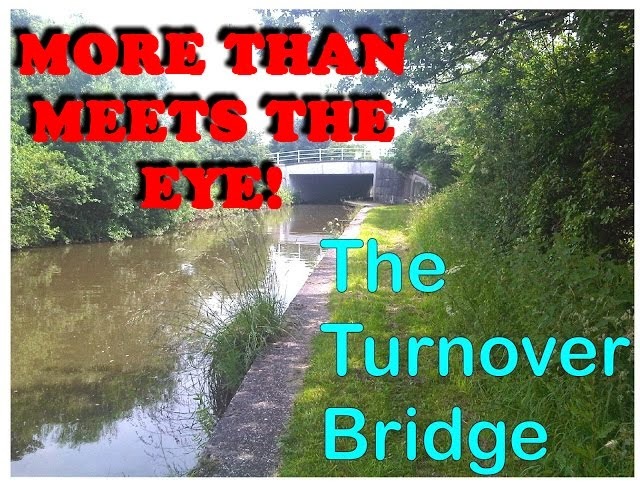 The whole area is completely overgrown and it's almost impossible to even see the river from the little bridge over the weir in Mill Lane..
We'll be featuring 'Now and Then' shots in a future posting to prove the point. 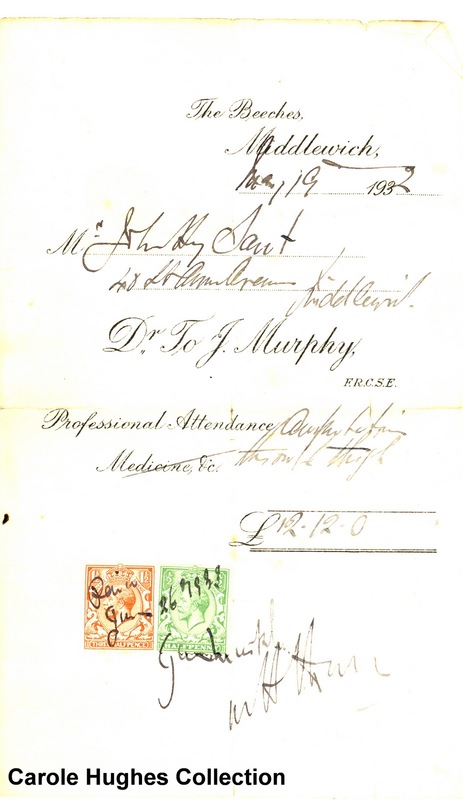 The recipient of the bill for 'Professional Attendance' and/or 'Medicine &c' was Mr J H Sant of 40 St Annes Avenue, who paid £12. 12s. 0d (or 12 guineas) - a lot of money in 1932. 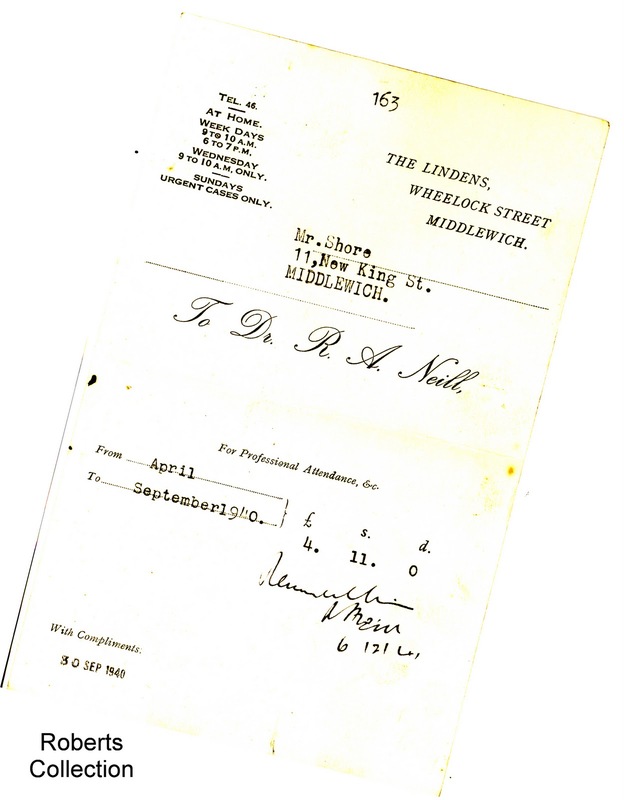 It's not clear quite what Mr Sant was paying for (and it's none of our business anyway) but it does show us once again how expensive medical treatment was in the days before the NHS. 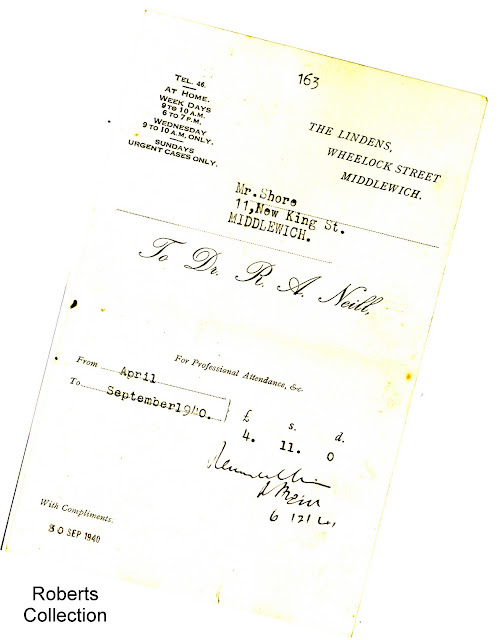 Stamp Duty of 2d was payable on the transaction and two stamps have been affixed to make up the total - a 'halfpenny' and a 'three halfpence' (pronounced three a'pence). The ins and outs of stamp duty are too complicated to go into here. 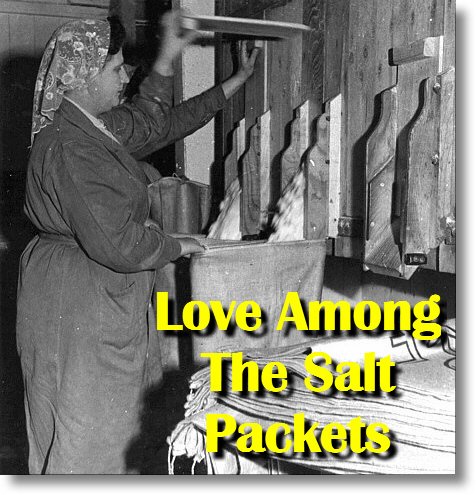 It was largely abolished on small transactions many years ago, but still applies in certain circumstances to financial dealings. Notoriously, a form of it is still applicable when buying property worth more than £125,000. But it's no longer necessary to 'sign over the stamp' as I used to do all those years ago in the Rates Office when I was selling dustbins to the good people of Middlewich. You'll note that Dr Murphy's address is given, in the best autocratic manner, simply as 'The Beeches, Middlewich', implying that no further information was required. At first we thought we had another 'where was this house?' 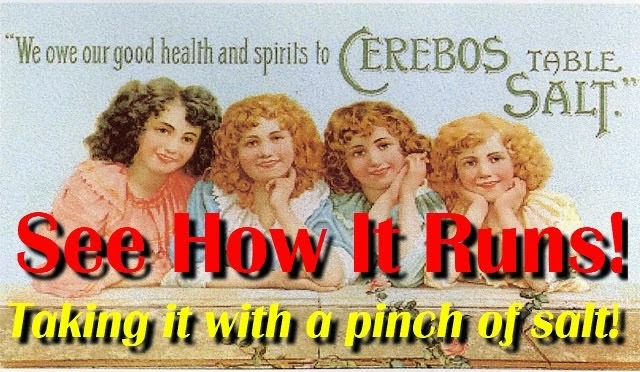 mystery on our hands but, thankfully, the answer in this case is quite simple. 'The Beeches' is that very grand house on Chester Road with the intriguing turret on one side of it. 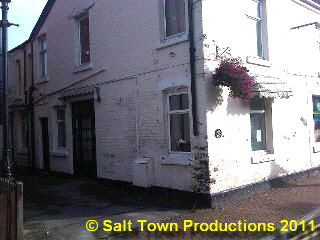 Dr Brown lived there at one time. People wanting to see Dr. Murphy would have to walk (or 'go traipsing' as they would no doubt have put it) all the way up to Chester Road to do so. 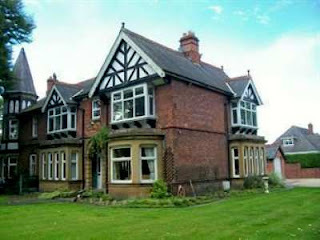 At the time of writing the house is on the market. And this is one property where Stamp Duty is definitely applicable. Here's another excellent example of a picture being worth a thousand words. 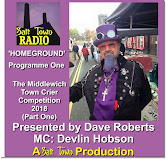 In this posting we were talking about the redevelopment of Middlewich Town Centre and the building of the 'Roman amphitheatre' in the Bull Ring, making the point that the area attracts 'huge' crowds during the Middlewich FAB Festival in June. This was no idle claim, as is dramatically illustrated in this picture which has been kindly supplied by Geraldine Williams. I couldn't agree more with your observations about present-day Hightown and the first impressions it gives of the town when approached from the Chester Road end of St Michael's Way. This is precisely why I took this photograph a couple of years ago. G.W. 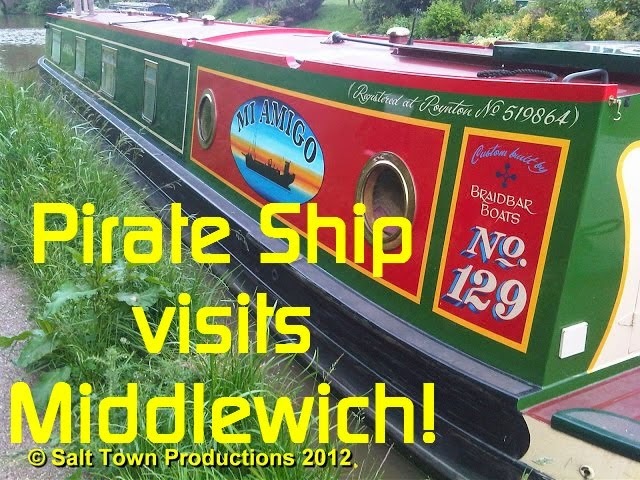 For some reason I could never fathom there was a certain element among the people of Middlewich, now, thankfully, almost extinct, which was openly hostile to attempts to attract visitors to the town, notably during the heady days when the Folk & Boat Festival was being established in the 1990s. 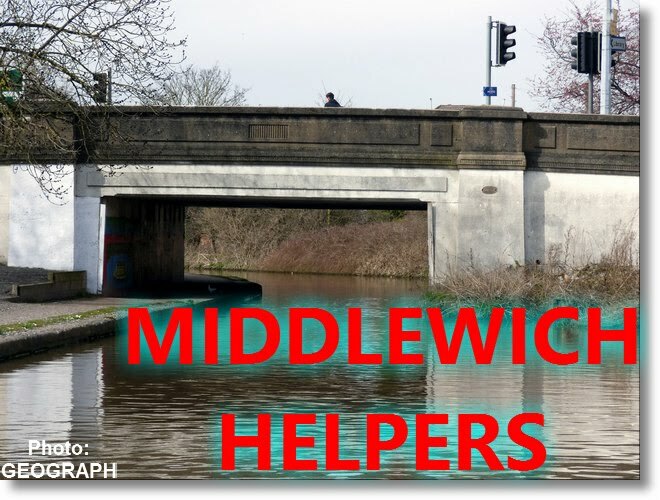 These were the people I dubbed the 'Keep Middlewich Miserable Brigade'. I offered to show him some photographs of the huge crowds of people attending our concerts, but he simply refused to even look at them. 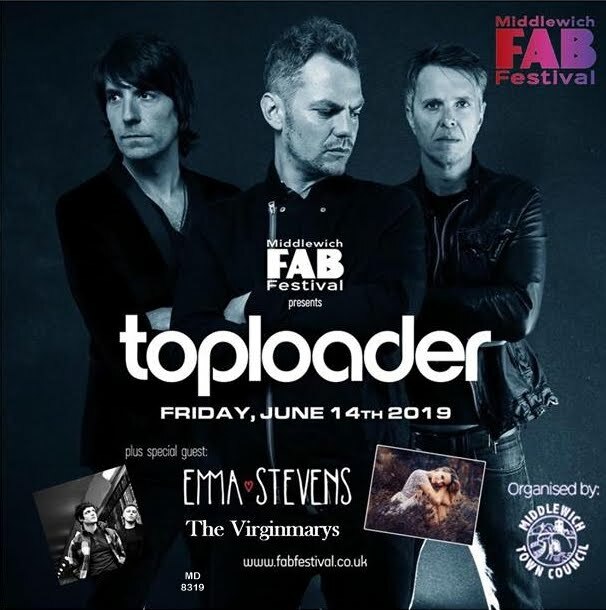 I loved the Saturday morning processions through the streets, not only for the colour, excitement and spectacle, but also for the boot up the bum it gave the KMMB as we brought the festival right into the heart of town, making it impossible to ignore. I'd see some of them skulking around Wheelock Street, desperately trying to pretend that the procession wasn't happening and I always made a point of giving them a smile and a cheery wave. Here's another view of part of the Sandbach-Middlewich-Northwich branch line showing some long-vanished railway paraphernalia and, in particular, the 'salt siding' (foreground) which connected Middlewich Station with the industries along the line. Dominating the scene is one of the semaphore signals controlling trains on the main running line. To accomodate the salt siding signals along this stretch of line were cantilevered out from the other side of the track and required guy wires to counter their tendency to tilt over. The signal arm should, of course, be a deep red and white rather than pink. This type of signal arm needs constant re-painting as red is one of the least stable of colours and fades rapidly in sunlight. Just above the salt siding can be seen a smoke deflector, put there to counter the effect of smoke and steam from fifty years of steam locomotives. 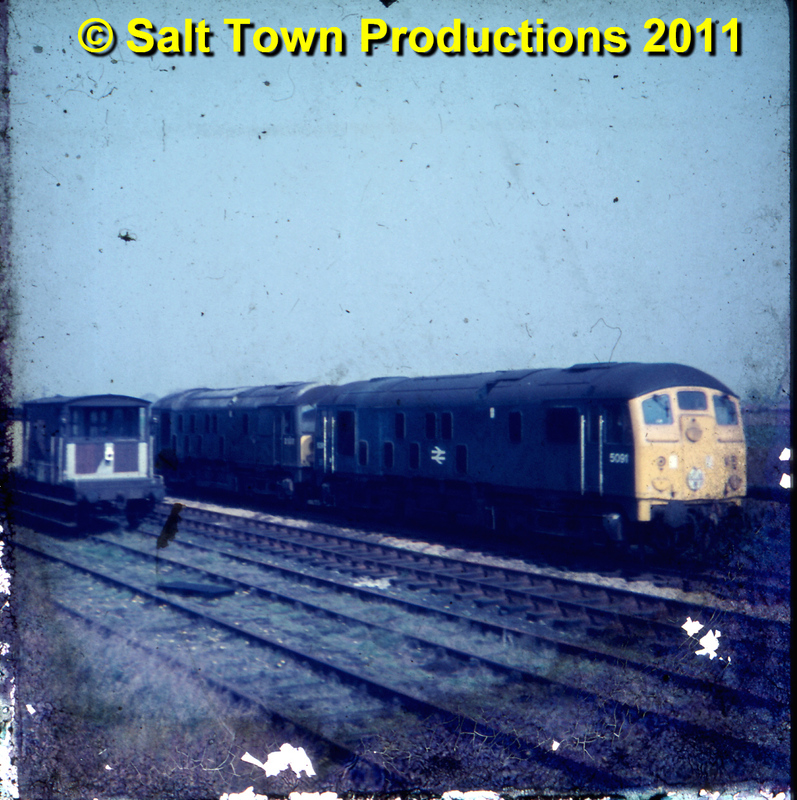 The little wooden cabin to the left of the signal is a shunter's cabin. This contained a telephone which connected with Middlewich signal box (which can just be glimpsed away in the distance - a small patch of white underneath the Holmes Chapel Road bridge). That telephone would today be worth a lot of money to an antique dealer. 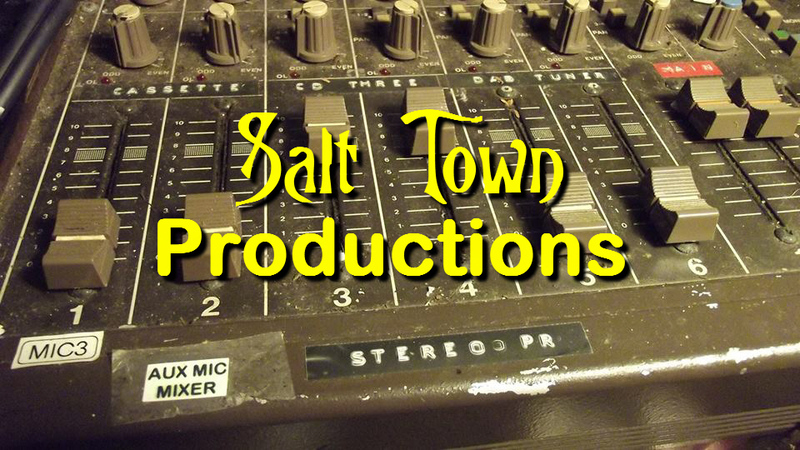 It was made of mahogany with bakelite mouth and earpieces and two brass bells on the top. This venerable instrument was used to pass instructions between the shunter and the signalman when they were preparing trains for their journeys out onto the railway network. To the right of the cabin can be seen the canopy (an inverted 'v' shape) of the loading bay at Seddon's/Simpson's in Brooks Lane and the rail connections which ran from the salt siding to serve Murgatroyd's salt works and the ICI soda ash works. 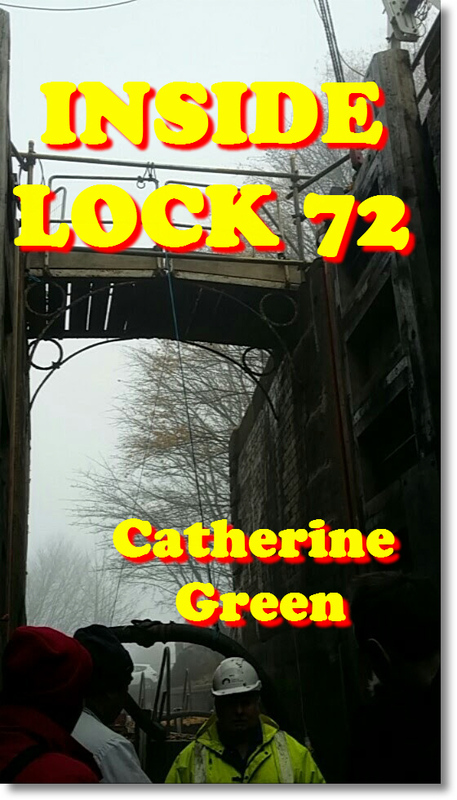 The ICI connection ran behind the Scout Hall in Brooks Lane and into the works via the ornamental iron gates which are still in situ at what is now the Pochin site. On the other side of the track, alongside the main running line is a pipe line which once carried brine. Out of shot to the left is Murgatroyd's brine pump (now the subject of preservation plans as it is the only remaining brine pump in the country still in its original position - i.e. over its brine shaft). When Murgatroyd's chemical works was established in Booth Lane at Moston in 1949 brine was sent from this pump along 'the brine line' to the new works. The pipe line shown in our photo is the one used for this purpose and remains in existence to this day. 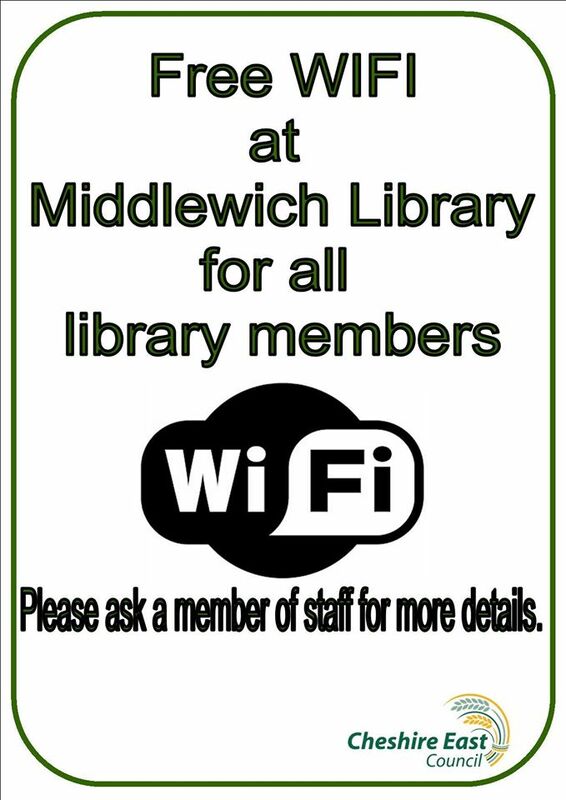 Middlewich Council's Heritage Officer, Kerry Fletcher, confirms this (see below). Just to the left of where the pipe line starts is the corner of 'Station Field' where fairs and circuses were held in former years. 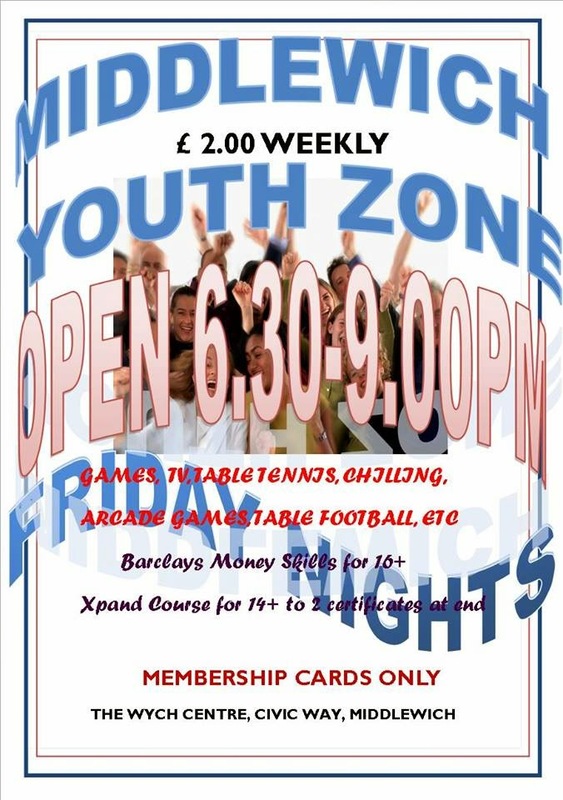 The field was also, in the sixties, home to the 'Dennis White Foundation' and boasted soccer pitches, changing rooms and a social club. It is in this corner that the Middlewich ROC post was situated, although it's not really possible to tell from the picture what was actually there at the time. The whole area is now, of course, covered in industrial units. 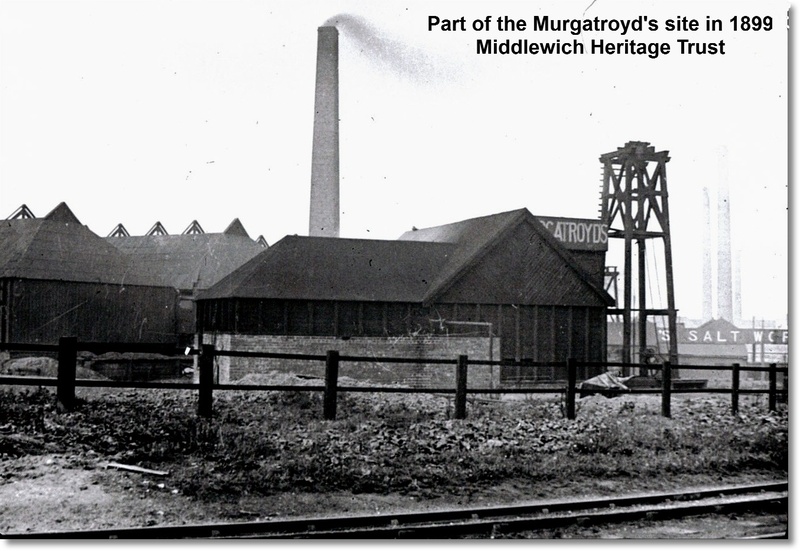 The Murgatroyd Brine Pump was used to supply brine to the Salt Houses and from 1949 to supply brine to the new Chemical site at Moston. Two extra pumps were set up which the pump man controlled to send pumped brine down the pipeline which was laid alongside the railway line. They are the ones in the picture and are still there. This pipeline was used up to 1977 when wild brine pumping ceased. Geraldine Williams Station Field was also used as a playing field by St Mary's School for football and for sports days were held there. 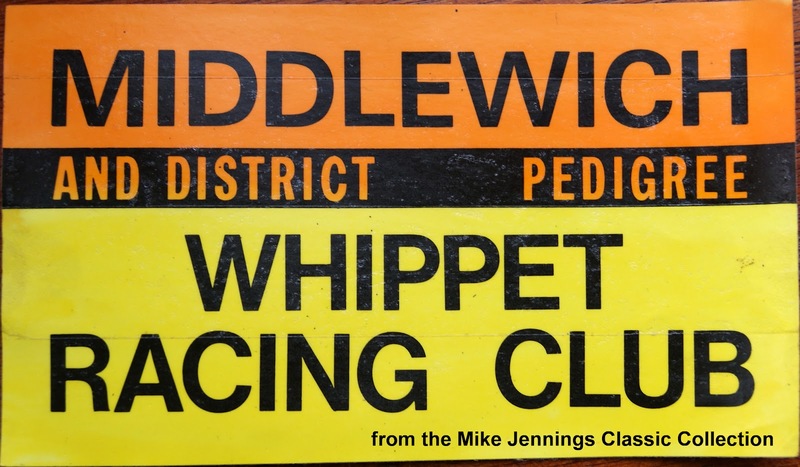 Denis - one-time Cllr - White used to hold whippet races on that field, using an upturned bicycle's pedal power to operate the 'hare'! All part of Denis' master plan to fund-raise for a swimming pool for the town. Hmm. Another scene which doesn't seem to have changed all that much in the last thirty-nine years, apart from the all-enveloping dense vegetation which has engulfed the town since then. This view of St Michael & All Angels Church and its environs can best be dated by the antiquated looking cars (and the fact that there aren't many of them) and the total lack of traffic lights on the bridge. 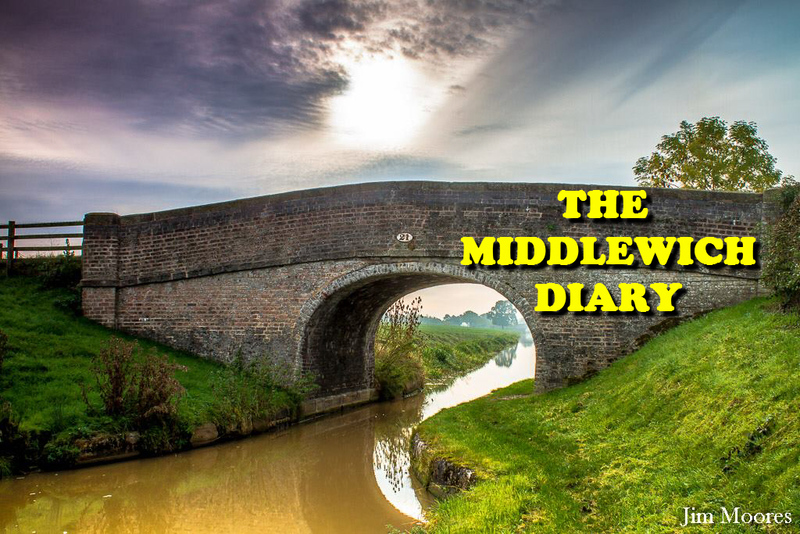 Few can deny that Middlewich these days is beset by severe traffic problems and that developments in the pipeline are calculated to make things much worse instead of better. Conversely, any scheme which might alleviate these problems has huge obstacles thrown up in its path. And how many towns are obliged to put up with a 'bypass' which comes to an abrupt halt in the middle of a field? Anyway, back to 1972; to the right can be seen one of those confusing local signs pointing the way to 'Council Offices Sandbach' which actually became less confusing two years later when the Congleton Borough Council came into being and based its main offices at Westfields.The green sign above it directs people to Stoke-On-Trent. 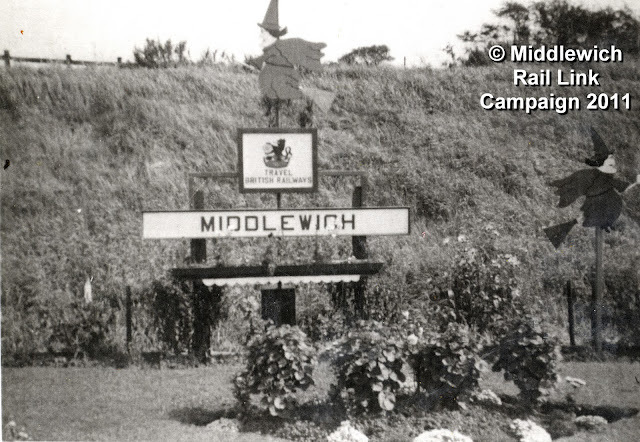 1972 seems to have been a pivotal year for Middlewich. It was the year that demolition began in earnest as the first stage in the 'redevelopment' of the town centre, and in this picture we can see the shops in Hightown which were sacrificed, along with the Town Hall, to create the much criticised 'piazza' in front of St Michael & All Angels church. A crude, rather home made-looking sign asking people to 'please cross over' can be seen next to the shops. To the right is that mysterious black oblong which seems to find its way into many pictures taken at the time. It's the canopy over the front of the 'Co-op Superstore' and it disappeared a long time ago. 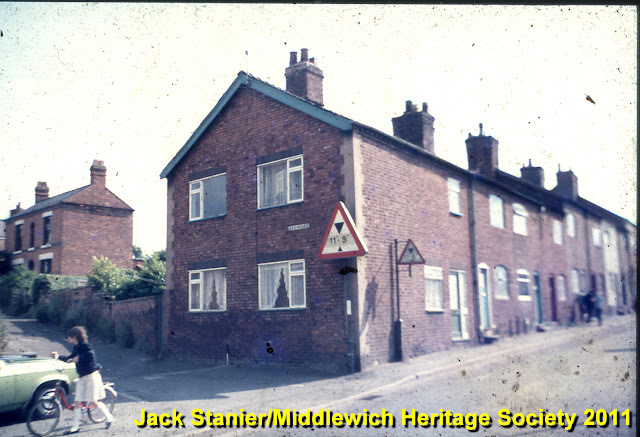 On the left, almost out of shot, we can just see Middlewich's war memorial, boarded up with what look like old doors, prior to its removal for protection during the demolition. 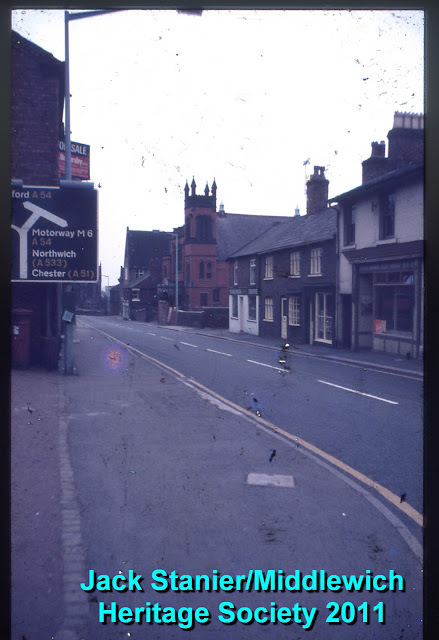 The 'No Entry' signs clearly show that the traffic flow at the time was in the 'Northwich', rather than the 'Sandbach' direction. For a time, after the traffic flow was reversed, and much to everyone's amusement, the old 'left turn only' sign at the bottom of Queen Street was left in situ when the newer 'right turn only' sign was put in place. Local people, of course, knew the score, but many a hapless visitor to the town ended up rather perplexed. In front of what was then the National Westminster Bank, out of shot to the right, is the bus stop, now replaced by the 'bus interchange' on a short stub of road which used to be part of Lower Street. The scene after demolition can be seen here. Two diesel locos, looking every bit as old-fashioned as the steam engines they had recently replaced, haul a goods train past some almost derelict looking sidings near the old ICI works. 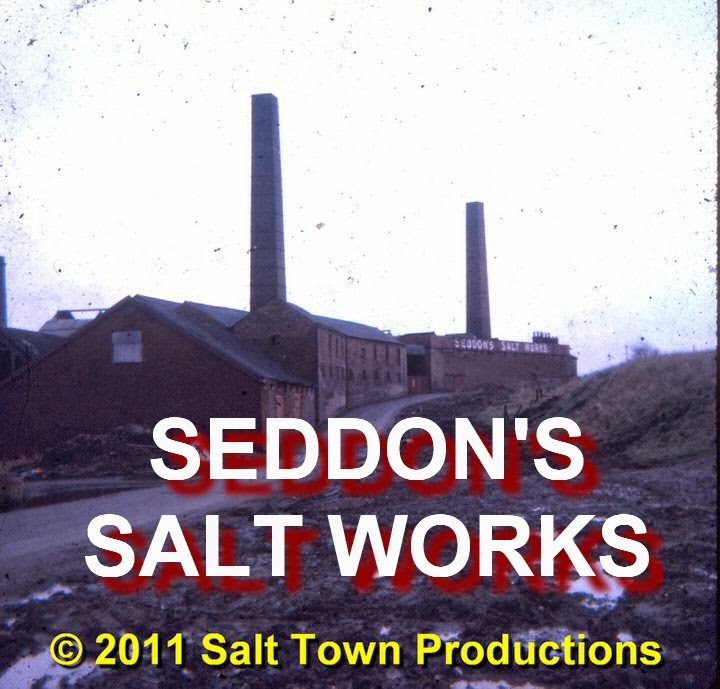 The track immediately to the left of the train is the 'salt siding' which was built in 1918 and ran in the direction of Sandbach from Middlewich Station to serve Seddon's salt works in Brooks Lane, the ICI soda ash works and Cerebos Salt (the former Middlewich Salt Company). This kept the numerous freight workings clear of the main running line. 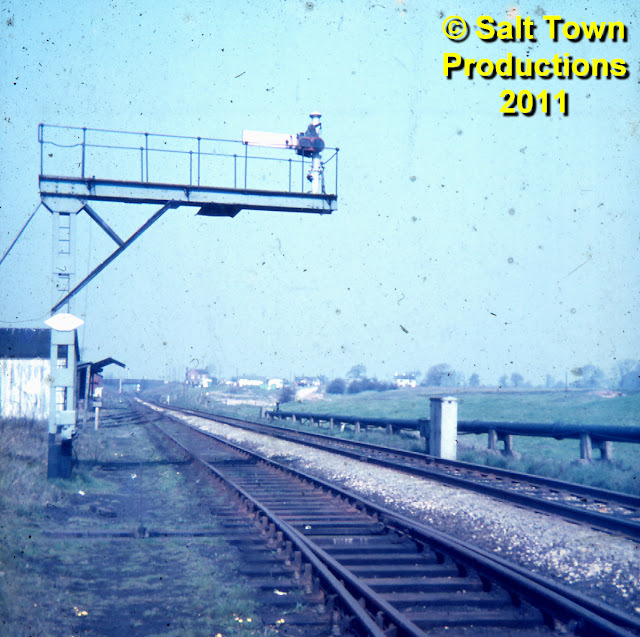 The salt siding disappeared in 1980 and replacing it would be a problem, as new signals have been placed on the trackbed on the approach to Middlewich. 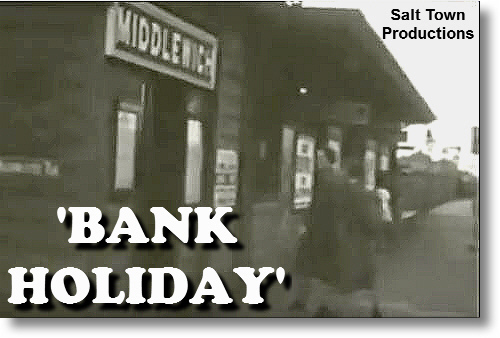 British Salt is now the only company on the Middlewich Branch served by rail (although the stub of a siding which once led to Murgatroyd's chemical works (later B.P Chemicals, Hays Chemicals and then Brenntag) is still in place at the Sandbach end of the line. On the left can be seen the end of a train parked on one of the sidings, with that once familiar sight on the railways, a guard's van, coupled to it. 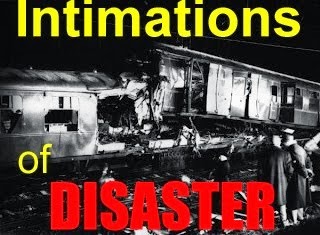 Improvements in train brakes mean that these vans are mostly no longer necessary, though they are used on nuclear flask workings and other special trains. Pronounced, for the uninitiated, 'Lee-ahs'. Lea's Passage is a footpath which links Nantwich Road with the top part of Newton Heath. The entire area has been completely re-developed since Jack Stanier took his photograph but, in a strange way, does not look startlingly different. 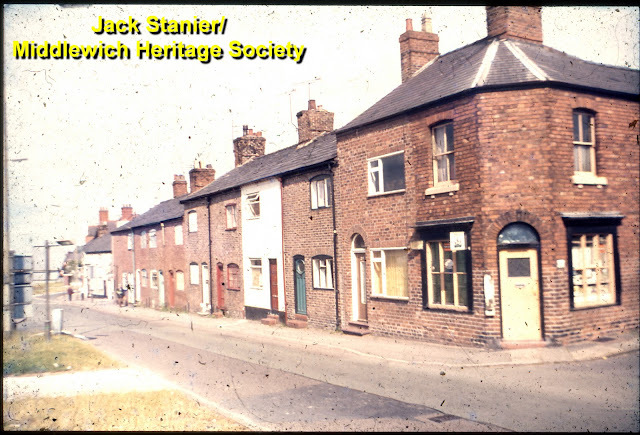 The interesting looking house on the left has gone and so has the stepped terrace of houses along Nantwich Road, which runs along the right hand side of the picture, and a sheltered housing development has taken their place. The house at this end of the terrace appears to be huge, and was probably two smaller houses at one time. The other houses in the row look positively tiny in this picture; there were a great many of these little houses in Middlewich at one time and many of them were, and still are, in this area of the town. At the top end of the terrace, at the junction of Nantwich Road and Newton Heath, was a corner shop which served this part of Nantwich Road and 'Newtonia'. 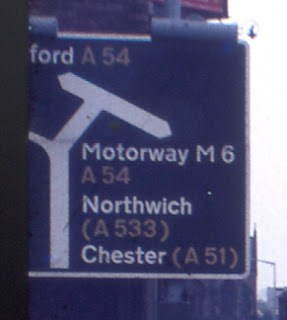 The large red triangular road sign is the 1970s version of a long series of signs in Nantwich road which have, over the years, warned lorry drivers of the presence of, and height of, the aqueduct (pronounced 'th'ackerdock') which carries the Shropshire Union Middlewich Branch canal over Nantwich Road about half a mile up the road. Its smaller predecessor is just to the right, and obviously must haved proved ineffective. The latest warning sign, placed a few yards further up the road in recent years, is a high-tech electronic version which flashes a dramatic warning to any excessively high vehicle to 'turn back'. Unfortunately, when some unfortunate trucker does activate the sign, innocent motorists, seeing it, and thinking it is meant for them too, also try to 'turn back'. Notwithstanding all these warning signs, bridge strikes are a frequent and apparently increasing problem. UPDATE (October 2016): The introduction of 'satnavs', rather than improving the situation, only seemed to make things worse, with the number of high vehicles hitting the aqueduct increasing all the time. 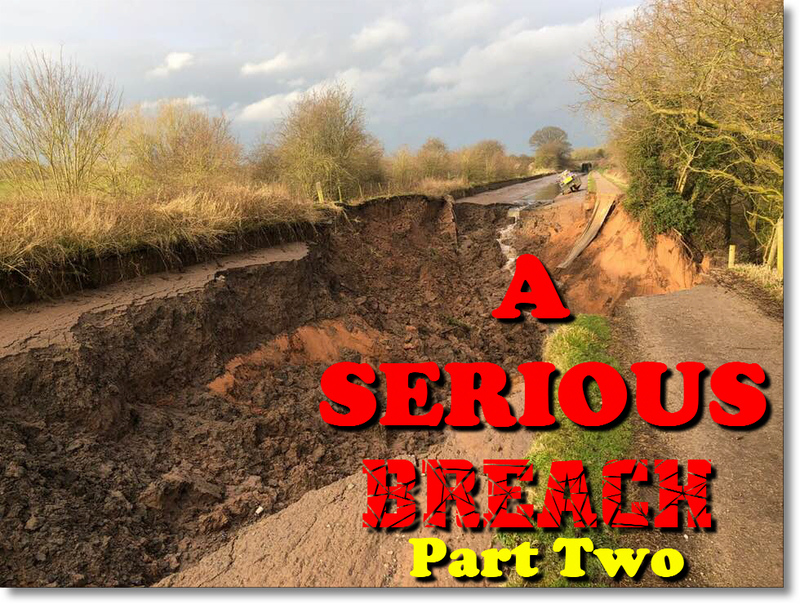 It was revealed in October 2016 that, quite incredibly, some satnavs show Nantwich Road passing over the SU Canal rather than underneath it! 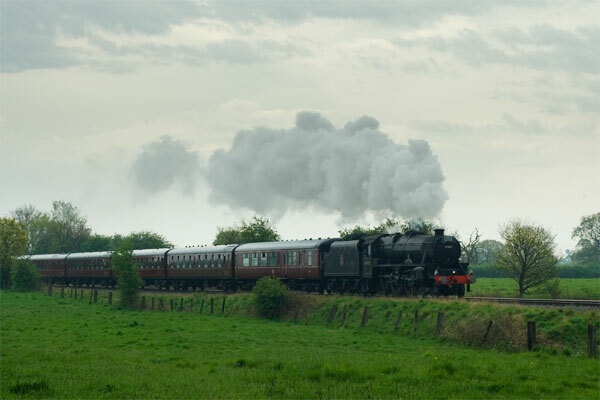 Here's another shot of the Cheshire Gardens Express on the Sandbach-Middlewich-Northwich line on May 4th 2008 - the first steam hauled train to use the line since 1968. 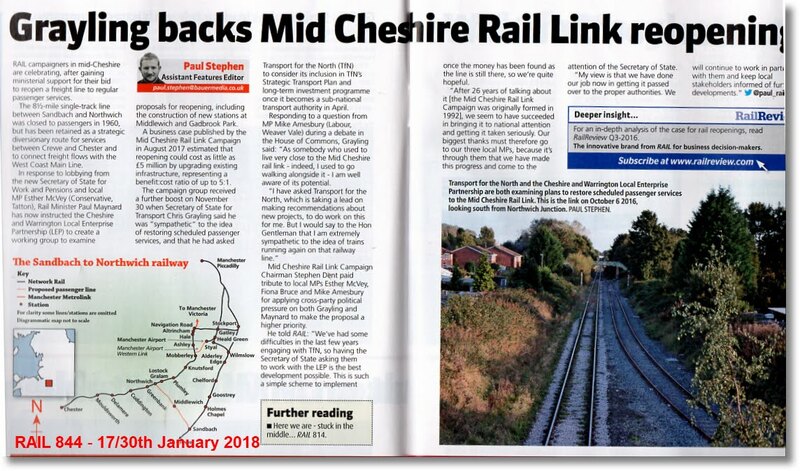 At the time of writing the Mid-Cheshire Rail Users' Association is planning to organise steam trains on the Mid-Cheshire line in 2012. but it's not clear whether the Middlewich line will be included this time around*. Our photograph was taken by Ian Hulme and is used with his permission. 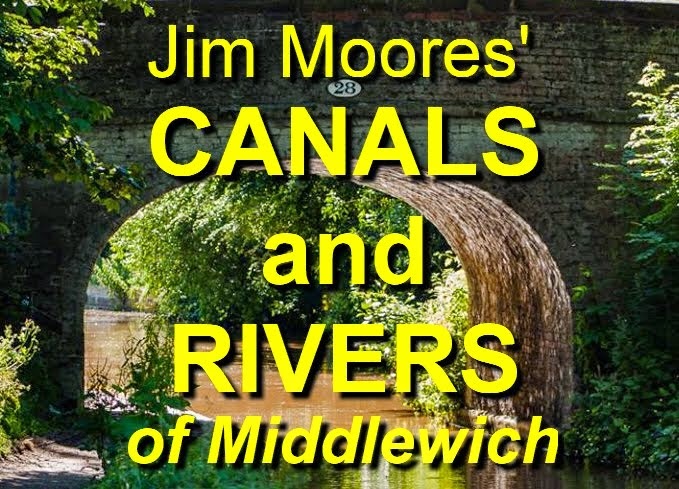 Ian has a large collection of excellent photographs of North West England, including Cheshire, on his website.